Across the street a person is framed in a watery yellow square. It’s a kid looking out – like me – except his head is wobbling about all over the place. He sort of tips it back and then it nods forward on a different angle. I can’t see his eyes, but I know he’s watching, checking out his new neighbourhood. When a new boy moves in across the road, Sticks isn’t sure what to think. He already has a best friend, Ranga, who lives down the road. Sticks and Ranga love getting into mischief, playing on the Playstation, and skateboarding. James has cerebral palsy, and is in a wheelchair – so he can’t do any of those things. Or can he? Where there’s a will there’s a way, and with James’ determination and try-anything attitude, plus the ingenuity and friendship of Sticks and Ranga, James could soon be flying. Unless something goes wrong. Dropping in is a funny, moving story of friendship. The three friends are as different as they are good mates, and each battles his own set of challenges – including bullying, ADHD and disability. What they have in common is their loyalty and their love of life, a blend which makes this a really satisfying story. ‘Well, maybe this is a way you can go. Read this,’ says Gran. She tosses the paper at me. Celebrate the spirit of ‘The Man From Snowy River’ with the Stockman’s Cup! $500 first place! George really wants to go to Bill Spills Water World, but it’s expensive, and a long way from Mumblegum, where he lives. Gran has a solution: he can enter a horse race on their old stock horse, Bandicoot. Not much can go wrong – unless Bandicooot’s friend Croak gets involved, or George is accused of cheating, or some rogue goats get free. 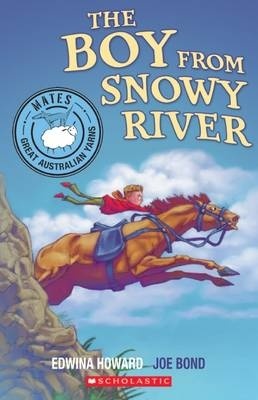 The Boy from Snowy River, new in Omnubus Books’ Mates series, is a fast moving, easy to read offering with plenty of humour. Colour illustrations, by Joe Bond, and text embellishments add interest and help in making the text accessible. 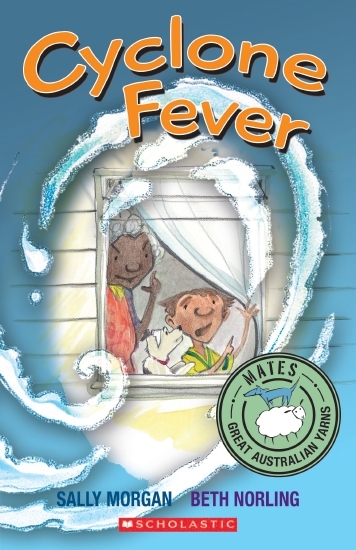 Lots of fun for lower primary readers. I live in a farm house. There’s no farm here any more though. Before I was born, this house sat in the middle of paddocks. They stretched from Cooper’s Creek to the top of the ridge. My granddad had hundreds of sheep, and a few horses too. Over time, the farm shrank like wool in the wash. Now there are houses where the sheep used to graze. A young boy narrates the story of his home, explaining that it was once part of a large grazing property, and that even though it is now part of suburbia, a little bit of the old farm remains. There’s Mum, Dad and Arkie; the vegie garden; the big gum tree and the tree house. And there’s Delilah the crazy-eyed goat and Lola the hand-reared black sheep. Unfortunately, grumpy Mr Meyer who lives next door is less than relaxed about his neighbours. There’s the noise, and the wandering animals. When Delilah eats some of Mr Meyer’s prize roses, he declares war. It’s up to the narrator and his little sister Arkie to find a solution. Larrikan Lane is a new offering in the ‘Mates’ series from Omnibus Books. These are short, fully colour-illustrated chapter books with fast-paced over-the-top stories. Each opening also features header and footer borders. Words that might be difficult or unusual are presented in different fonts. At the completion of the story is a spread about the story or the idea being explored. In Larrikan Lane this spread explores the notion of larrikins and urban vs rural living. ‘Larrikin Lane’ shows how hostility between neighbours can be converted into cooperative living with just a little understanding and compromise. 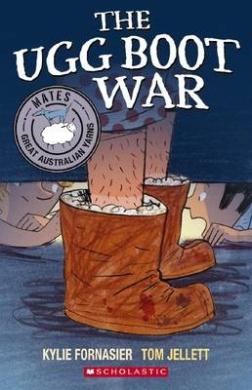 As with all Mates titles, Larrikan Lane is a humourous and rewarding read for newly-confident readers. Monday morning. School Assembly day. I have to give a report on our team’s soccer match on Saturday. I have to stand up on the stage in the big school in front of everyone. It’s the Monday after the Saturday before, when the Wiggly Worms played and lost in the final soccer game of the season. The un-named narrator has to present a report on the game and from the score – 15 to 1 – its going to be tough to present it in a positive light. But as he recalls all the elements of the game, from the parents cheering on the sidelines to the improvements made by individuals he discovers there is plenty to say about their favourite winter sport. Illustrations are full of humour. Header and footer carry a story of their own, a soccer game between a Wiggly Worm and a Rotten Rat. Losers? 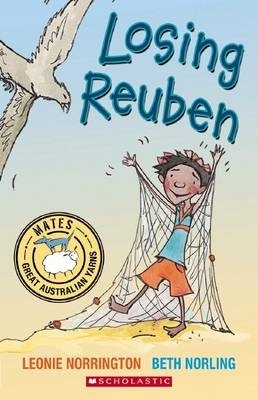 is a new title in the Mates series of ‘Great Australian Yarns’. Weekend sport is part of many Australian lives and many players and their families will recognise the characters portrayed here. There’s the enthusiastic but unskilled coach, the fierce and way-too-serious coach, advice from the sidelines, the player keen to play but terrified of the ball, the player who has no clue about the rules and many others. Each is almost caricatured for effect, burying truth in humour. The narrator uncovers the real reason to play sport and it’s not all about winning. The print size is large and potentially unfamiliar words are presented in alternate fonts. Losers? 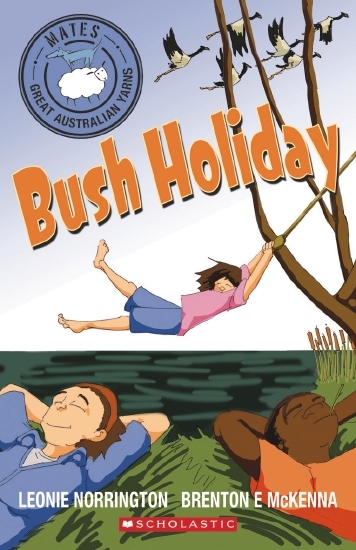 is a funny and fun addition to a great Australian series for newly emerging readers. This book can be pruchased online from Fishpond.